We are delighted to welcome new team members to our SFC community! Alex Canepa provides strategic guidance to our SFC Farmers' Markets and leads the organizations policy and advocacy efforts. He works to reduce the barriers that farmers and ranchers face bringing their food to market. Alex believes that in order for food to truly be sustainable, farmers and ranchers need to be able to make a living growing it. Before arriving at SFC, Alex served as the Research Director of the National Farmers Market Coalition and led research on agriculture and food policy for the non-partisan Texas Senate Research Center. While at the Texas Senate, Alex worked with members of the Committee on Agriculture, Water, and Rural Affairs and their staffs address the challenges facing Texas farmers and ranchers. He has also worked as a graduate researcher at the University of Oxford’s Future of Food Program where he researched the intersection of agricultural economics and public health. Alex holds a Master’s Degree from the University of Oxford and a Bachelor’s Degree from Trinity College Dublin, where he earned a double first-class honors degree in History and Political Science. Mia Burger is our newest Grow Local team member. She will be coordinating our community-based gardening classes, as well as managing Spread the Harvest, which reduces financial barriers to food gardening by providing free gardening materials to schools, community groups, and individuals. Mia grew up in the Willamette Valley of Oregon, where she first discovered a love of gardening and cooking. After graduating from the University of Oregon with a BA in International Studies and Spanish, she pursued her interest in agriculture by working on an organic farm in Ecuador. This experience inspired her to obtain an MSc in Agricultural Sciences from the University of Hohenheim in Stuttgart, Germany, during which time she completed an institutional assessment of the agricultural extension system on Panay Island in The Philippines. Mia is excited to apply her interests in sustainable agriculture, community education, food policy, and nutrition to help others discover the joy of gardening. Sergio Torres is joining our SFC Farmers' Market team, but he's certainly not new on the block. 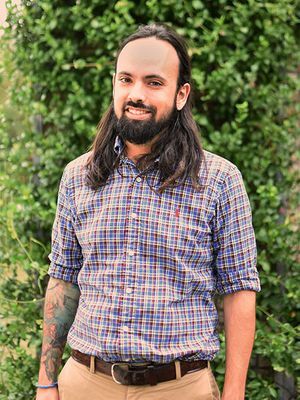 Sergio has years of experience working with the food system in Central Texas, in both local stores and farmers markets. He has done every job and side-gig that you can imagine, which provides him with a good amount of knowledge of where food comes from, and how it is prepared and consumed. 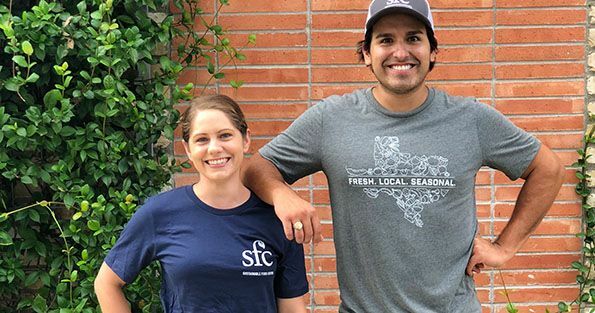 His role at SFC is to facilitate the communication between local farmers and producers, and SFC's Farm Direct programs (Farmers' Markets and Farm to Work), in order to provide support and connections for existing and new vendors. Sergio is passionate about helping local business grow and thrive, and will go lengths to make sure that happens. 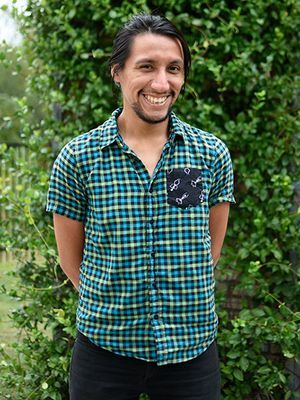 Sergio was born in Lima, Peru, and has been living in Austin for about a decade. His career in the local food industry started with a job a local food coop, and through the years he began to learn more about the value of keeping what you eat local. He worked several farmers markets as a vendor before finally enrolling in the Sustainable Food Center front lines as part of the market crew. Alex Mace first experienced community-level food systems while doing a service year with AmeriCorps in the small town of Williamson, WV. There, he worked together with neighbors of this tightly-knit community to build a large community garden. Seeing the whole community show enthusiasm and joy about the community garden propelled Alex to continue to engage with community food systems, particularly, with food access. Alex went on to pursue a Masters in Public Health at Tulane University. During that time he worked with multiple food systems organizations, engaging with community members in garden and nutrition education while developing his own growing skills. He also completed a thesis examining the social and cultural context of Urban Agriculture in New Orleans. Alex is excited to join SFC's Food Access team, seeing that SFC takes a holistic approach to the complex and multi-faceted issue of food access. He is particularly looking forward to applying his research skills to support SFC's role in our rapidly changing food system. Welcome, Alex! Alex Canepa, Mia, Sergio, and Alex Mace each bring a unique perspective and skill set to our work, and we are honored and excited to welcome them . Please join us in giving them a warm SFC welcome!